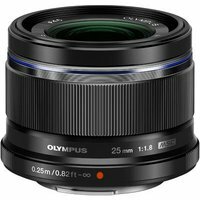 The Olympus 25mm f1.8 M.ZUIKO Digital lens in black is an ultra-compact, lightweight prime lens with bright, f1.8 aperture to ensure excellent optical performance in all situations. The lens' optical construction ensures your point of interest is stunningly sharp, while the surrounding background is beautifully soft with a natural bokeh (blur) effect. The lens features a built-in MSC mechanism for quick and quiet autofocus operation and offers a 25mm minimum focusing distance, which can be increased to 17cm with the optional Olympus MCON-PO2 Macro Conveter. The texture and build quality of this lens is designed to seamlessly integrate with the Olympus Micro Four thirds cameras, such as the OM-D E-M10.